A few weeks ago, I ran into a friend I hadn’t seen in years. We talked all about the usual things – the kids, the husbands, the jobs, and, because we both homeschool, the learning. We laughed about how little our children used to be and how much they’ve grown. Then, she said something that made me want to hug her and cry, all at the same time. “Right,” I said, giggling a little. My oldest son is heading into his high school years. My youngest is just beginning middle school. After homeschooling middle school now for three full years, and staring down the reality of three more, there are a few things that still surprise me about this particular season of learning. These years are called the middle years for a reason. Not quite children, not quite teens, I have found that this age group can fit in either, or not fit anywhere at all. This is especially true in homeschooling. The old field trips are no longer exciting – unless a friend wants to come along and then all of a sudden, the aquarium touch tank is a thing of complete and total beauty. The read-alouds are babyish, but pull out a thick classic, and it’s too much. I have found that trying to incorporate elements of both makes the most sense. We still do lots of hands-on activities, but also throw in serious science or something gross to round out the developmental appropriateness. Call it not feeling comfortable with the young ones or the teens. Whatever you call it, in my experience, these years are the ones that bring the most resistance to learning. What once worked beautifully as a morning routine is suddenly boring. The daily expectations are met with questioning and protest. The homeschool picture of you and your kids curled up on the couch reading turns into you and your kids on the couch trying to work through character concerns. The good news? Because nature of these years is that they are both too old and too young at the same time, you still sometimes get snuggles on the couch and excitement over that fun science experiment you planned. I try to remember, when the resistance comes, our children need these years to push and pull, figure out who they are, and do it in the safety their family provides. I LOVE all the resources that now exist for homeschooling high school. Getting ready for my oldest son’s next season has been a breeze. The options for curriculum are excellent, and there is tons of support available from other virtual moms. The middle school years can be a little trickier when it comes to resources, but they are there! You just have to look a little harder. Perhaps the biggest surprise of all for me has been the realization that even though these years can be so different – even challenging – our decision to homeschool is still working. My boys are confident in their abilities, and they continue to learn in ways that complement their individual learning styles and differences. As much as these years bring turmoil and the beginnings of the search for a sense of self, I am grateful that we have the opportunity to do it all together at home. My friend was right. Change and growth always cause a bit of discomfort and the middle school years are filled to the brim with both. These years can be weird. I am finding they can also be wonderful. What has surprised you most about homeschooling middle school? The middle school years, 6th-8th grades, are an exciting time of change and increasing maturity. Kids still enjoy the fun and exploration of the elementary years as they start moving toward the more serious, preparing-for-adulthood high school years. 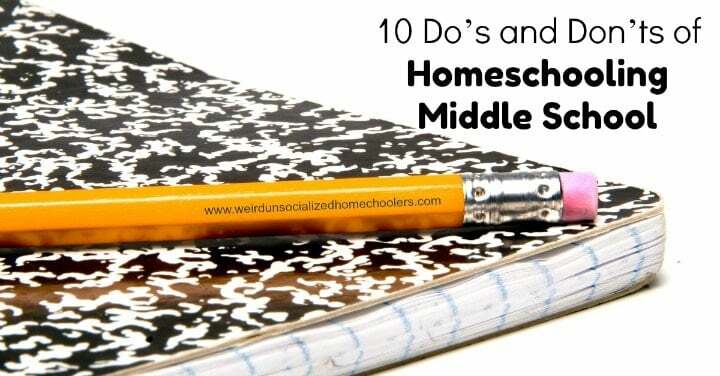 Make the most of this time with these ten do’s and don’ts of homeschooling middle school. Do use middle school as a transition to high school. Middle school is an ideal time to start transitioning to high school in regards to expectations of independence, maturity, and quality of work. Parents will begin moving away from more teacher-intensive days and kids will start working more independently. It’s reasonable for you to expect more detail in their written work, research, and science labs. Do use the middle school years to begin to practice for high school. Use 8th grade as a practice year for high school (for you and your student). It’s an excellent time to begin tracking grades (if you weren’t already), figuring out plans for high school, and learning how to keep a transcript. Shore up weak areas (such as writing skills or speed with multiplication fact recall) so that your student is prepared to work on his own. Do move toward greater independence. Middle school is the prime time to start handing over the educational reins to your child. Teach your student how to schedule her own week and maintain a planner. Teach him study skills (because they don’t come naturally to most of us). Help your kids learn how to break down long-term assignments into manageable chunks, each with their own deadline. Do begin to add student-choice electives. Part of handing over those educational reins means giving your tween or teen some say-so in the classes he takes. Encourage your student to pursue his interests. School is more fun when you get credit for doing the stuff you love. Start including more life skills training and home ec in your daily routine. Do begin to let your student make choices (and mistakes!). Sometimes it’s hard to allow your kids to make their own decisions, especially when you see all the things that could go wrong. But life is full of choices and their consequences. Let your kids make the not-life-altering decisions while they’ve still got you to guide them through the consequences of poor choices. Don’t set your middle school student adrift. Don’t forget that they’re still kids. Don’t forget that your middle school students are still kids. They’re dealing with changing bodies and raging hormones. Increased expectations may stress them, particularly when they are struggling in an area and aren’t quite sure how to deal with it. Remember that any kind of transition is often a “one step forward, two steps back” process. Don’t hesitate to come alongside them and coach them on dealing with stress, hormones, and looming deadlines. You don’t have to fix their problems, but help them brainstorm solutions. There are so many benefits to reading aloud. Don’t stop just because your kids are getting older. Older kids mean that you choose read-alouds with more complex characters and storylines. In other words, you get to read more books that you will enjoy as much as they do! Don’t stop arranging play dates. Okay, you’re probably going to have to stop calling them play dates, but don’t stop planning social activities for your teens and tweens. They still need plenty of opportunities for socializing with their friends. Don’t quit planning field trips. As our kids get older, we sometimes let too much of the fun stuff fall by the wayside in favor of more serious school. However, teens and tweens can benefit as much – and maybe more – from field trips as younger kids can. Brainstorm the best field trip ideas for teens, choose those that appeal to your family, and invite a few friends or just head out as a family. 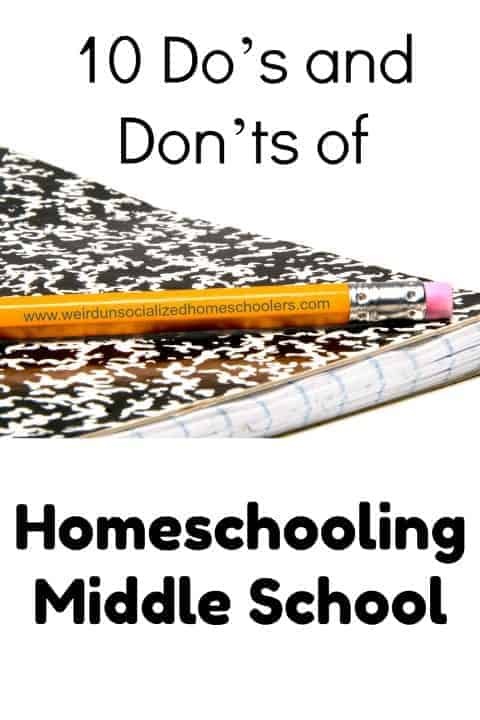 Homeschooling middle school is an exciting transitional time for you and your child. Try these tips to make it a smooth transition, as well. What tips would you add from your own experience? One of the greatest challenges of transitioning from parent-guided to independent learning can be developing strong study habits. That transition typically begins in middle school with the goal of having primarily self-directed learners by high school. By the time your student reaches middle school, you should begin moving toward independent study time. Try these study tips for middle and high school students to help your student develop strong independent learning skills. First, help your student find his best study spot. For some kids, this may be the dining room table, where they have room to sit and spread out all their books. For others, it may be a desk in their room, the living room couch, or sprawled out on their bed. Even a porch swing or a blanket on the grass can be an ideal study spot in warm weather months. Next, you want to set the mood for studying. Some students (and adults) prefer quiet for working. Josh and I can work for a couple of hours in companionable silence at the dining room table. Other students, like Megan, prefer listening to music while they study and complete schoolwork. Letting Megan listen to music while doing schoolwork might drive me crazy if I didn’t know that many studies prove that some people concentrate better with background noise. Granted, the music she listens to probably isn’t as conducive to learning as something like classical, but as long as she’s comprehending her schoolwork – and using headphones – I’ll live with it. If you or your kids work better with a little background noise, but find music distracting, check out Coffitivity. It’s a site that streams ambient white noise. Although I prefer quiet, I sometimes use Coffitivity to drown out other distracting sounds that come part and parcel with working from home. Whether your student prefers a quiet study area or one with a little background noise, make sure the chosen spot fits the bill. Well, you know, as much as possible. Sometimes those of us who prefer quiet are out of luck in a busy household. One of the most important skills your student will ever learn is effective time management. The ability to prioritize tasks and work without supervision are two skills that sometimes give homeschooled students an edge over their traditionally-schooled peers in college. By allowing our students to work at their own pace and choose how and when to work on individual subjects, they may go to college better prepared than students used to regular 55-60 minute blocks of instructional time. We need to be purposeful in teaching these skills because they are learned behaviors. We found the Victus Study Skills System very helpful, but there are probably some things that you’re already doing to help your student develop good habits. Set and enforce due dates. We’re not doing our students any favors by not establishing consequences for unmet due dates. Schedule time for studying. My kids have a space for “study hall” on their daily checklists. Discover how your student studies best. Does he need a study partner? Do drawings and diagrams help? Would she benefit from a site like Quizlet? As parents and educational facilitators, we need to be modeling excellent time management skills, too. Just saying. It is so easy to get distracted when you’re doing something that is not at the top of the list of things you want to be doing. Even as an adult, I have trouble not getting distracted by electronics and even household chores. Sometimes, unloading the dishwasher is preferable to whatever I’m supposed to be doing. Don’t allow electronics during study times. I’m not as diligent about this as I should be. Most of the time, my kids are pretty good at self-regulating. In the past, I made them leave their phones with me until they had finished their schoolwork. I let them check their devices during short breaks between subjects. Block social media sites during school hours. There are downloads and apps for blocking specific sites during times that you set up. LeechBlock is a Firefox extension, Cold Turkey is a download, and Self Control is an app for Mac users. You may also be able to set something up in Parental Controls, depending on your computer or mobile provider. Keep study spots clean. Many people are easily distracted by clutter. If your students are that way, it’s important for them to keep their study areas clean. Even if your kids can work amid the mess, too much clutter can hurt their productivity. We’ve found checklists to be very helpful in keeping everyone on track. It eliminates I-forgot-itis. And, I’m not just talking about the kids. I’m terrible about forgetting things without a list, too. For school, we like the Basic Unlabeled Weekly one-page planner from DonnaYoung.org. I add checkboxes to it because we all derive great satisfaction from checking boxes. My kids know that they can do their schoolwork in any order and even work ahead in subjects or work in blocks (history on Tuesdays and Thursdays and science on Mondays and Wednesdays, for example) as long as they complete everything by the end of the week. We also love the planners from A Plan in Place. I use the homeschool teacher planner and the kids like the student planners. I love the TickTick app on my phone for work or household reminders and to-do lists. Some kids may prefer using work crates. Brianna found them beneficial all the way through high school. Finally, I have found it helpful to check in with my kids on a regular basis. Some homeschool families have a morning meeting during which mom or dad and students go over what was done the day before, what needs to be done during the current day, and any areas of struggle or concepts that may need to be clarified. I’ve found it helpful to peek in on my kids a time or two during the day. I do this at times that when it’s easy for them to get off-track – within half an hour of getting started back after lunch (because sometimes it’s tough to get back to schoolwork) and in the late afternoon when they’ve been working hard for awhile, and their concentration levels may be waning. Sometimes just peeking in and asking how they’re doing or if there is anything they need help on is enough to make sure everyone stays focused. What study tips have you discovered that work well for your independent learners? Homeschool Like a Boss. Literally. Written by Shawna Wingert of Not the Former Things. One of my favorite memories of our first year homeschooling is building a baking soda and vinegar volcano. My boys were six and nine and had never made one before. They carefully crafted the volcano out of clay. We discussed the basics of chemical reactions and covered the three states of matter. Then we poured in the vinegar. I now have a twelve-year-old and almost fifteen-year-old. While the subject matter has intensified and their interests have changed, the same is still basically true – my children learn best through hands-on learning. Here is what I have learned about a more activity-based approach for older learners. 1. Online learning is our friend. As my boys have matured, their level of engagement with digital media has as well. This has been a tremendous benefit in finding and incorporating activity-based learning into our homeschool. YouTube has step-by-step demonstrations of science experiments and computer builds. We use Minecraft to create models of historic battles and literary locations, and Mythbusters has been our primary source of science for two years. When it comes to ideas for activities, online resources cannot be beat. 2. It’s important to think long-term. The easiest way for me to find hands-on opportunities for my boys has been to consider their long-term aspirations and use them to form school projects. For example, my oldest would like to someday work with computers for a living. So we have incorporated computer builds into his science lessons. My youngest adores animals and will tell you he wants to be a zoologist someday. As a result, we have way too many pets that he cares for as part of his school day. He has also built models of different habitats for climate-dependent animals (Amazon rainforest snake vs. African desert snake, etc.). 3. Bigger kids mean bigger messes. Gone are the days where we sing the clean-up song and wash out the paint brushes. As my boys have grown, so has the size of their messes. At any given point in time, you will find computer parts piled up in our garage and covering my son’s desk. We have eight different terrariums outside as well, none of which have an actual creature living in them. We recently tested our water for safety (another hands-on science experiment) which went well. But soon, we were testing all the water sources all over the house. Test tubes and test strips were everywhere by the end of the day. 4. It’s totally worth it. Although it does require more of me in terms of research and time, the benefits of hands-on learning far outweigh the costs. Our days are smoother; my boys are more engaged and, honestly, experiential learning is just a lot more fun. Are you including hands-on learning for high school and middle school? What works best in your home? Computer class has come a long way from the days when my friends and I spent most of the hour-long class playing a game I vaguely remember. It was some sort of step-by-step logic game where you had to get this man out of a room or something. Does anyone remember what I’m talking about? All I remember was that my 16- and 17-year-old friends took great pleasure in telling the man to stand up because that resulted in the computer responding with, “You are now erect,” which was pretty racy humor back in the day. Then, when I was in my mid-twenties, the real-job insurance company I worked for got computers with Windows. That was fancy-pants stuff, y’all. In our training class, we got to play solitaire – for pay, on company time and everything! It was so we could learn to work the mouse. When Josh told me he wanted to learn to code, I immediately asked the Internets – you know, the folks on my Facebook page. I wanted to share the recommendations that I got with you because I know that coding is a high-interest topic for many kids. I’m sure that I’m not the only parent wondering where to find good resources for teaching a subject that I don’t fully understand myself. Khan Academy has a strong reputation for providing sound, quality instruction on a variety of topics. They have a strong learning toward math, science, and technology topics, including computer programming. When I asked for recommendations for coding classes, Khan Academy came highly recommended. Josh picked out three or four self-paced programming courses. He’s working his way through the Complete Java Masterclass and learning a lot. He’s really enjoyed the class and likes the fact that he can re-watch any lessons he needs a bit more clarification on. Many parents also suggested Code.org, a non-profit organization dedicated to making computer science courses available to all students, wherever they are. Their goal is to increase the participation of women and minorities in computer science. They offer their curriculum and tutorials free of charge. Easy Peasy comes highly recommended as an outstanding free resource for homeschooling families in general, but they also offer free computer courses as part of their high school classes. We may look into this more carefully once Josh completes the Udemy courses because they offer a ton of computer classes. They’re all self-paced and free. Another option for learning coding is W3 Schools Online. It’s a site that offers written and screenshot tutorials for a huge variety of programming languages like HTML, CSS, and Java. W3 Schools online in another free, self-paced option for learning code. They have several different books for different programming languages. So far, Udemy is the only resource we have personal experience with, but all the others were recommended multiple times, so I wanted to share them. Have you used any of them? What did you think? What resources would you recommend for kids and teens who want to learn to code?